This post by Armed and Curious is the most uplifting thing I've read out of Iraq period. The joy of the Iraqi's at this ceremony is wonderful to see. And the pictures are amazing! "This is a different Iraq than the one I left two years ago in so many ways. I am constantly surprised this trip when something subtle points to such an obvious change. It is often only much later that you recognize the measure of what you have witnessed and often it’s the absence of things such as explosions and small arms fire in the distance that point to the progress having been made." Read the whole thing. You'll be glad you did. Those of us who were addicted to our fix of LT G and The Gravediggers were dismayed to find that the Army bureaucrats forced him to shut down his blog and delete all the files. Why? Because he refused take the position of XO (Exceutive Officer) and wrote about it. He usually had all of his posts vetted but not this time. His fiancee, City Girl took over the reins and is keeping us in the loop 2nd hand. Lt G has since been promoted to Captain and is still with The Gravediggers. Obviously they realize what a superb officer he is. He now has an LT of his very own. Not only is he a superb officer he's an absolutely brilliant writer with a wicked sense of humor. Hi final blog entry on June 27, 2008 received an astounding 159 comments. I've also put a link to the archives on the right. If you like to read good writing and haven't read him you owe it to yourself to read KABOOM from the very beginning. There is something special about combat medics; they are eager to save lives and help the wounded; fellow soldiers as well as local Afghans. Such was the case for Pte. Colin Willmot a medic with 1 Field Ambulance at Edmonton Garrison. Pte. Willmot was killed last Sunday morning by an IED while on foot patrol. Ironically Pte. Willmot was not originally slated to join his peers from 1 Field Ambulance to deploy to Afghanistan. When he learned of the deployment he started bugging his regimental sergeant major to include him on the mission. Finally a vacancy opened up and he got his wish. He was flown to CFB Trenton yesterday for a formal ramp ceremony and today there was another convoy of hearse and black limousines on the Highway of Heroes. RIP Pte. Willmot. According to Canwest News about 15 family members attended a repatriation ceremony at the Canadian Forces Base in Trenton, Ont., Wednesday for a Canadian soldier killed in Afghanistan on the weekend. An Air Bus plane carrying the body of Pte. Colin William Wilmot touched down at CFB Trenton at about 2 p.m. for the traditional ceremony to honour fallen military personnel. Defence Minister Peter MacKay attended the sombre affair for Wilmot. 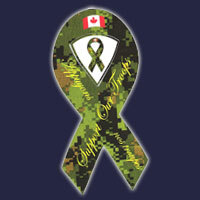 Lt. Annie Morin with CFB Trenton said as well as friends and family, a man with a tractor-trailer painted brightly with the words "support Our troops" attended the service to show his support. "It was nice," she said. "We don't normally see that." The 24 year old, who has been described as an easygoing young man with a keen intellect, had recently returned to the war zone from leave and was extraordinarily proud to be engaged to his fiancee, Laura. Journalist Doug Schmidt has been embedded with Canadian troops in Afghanistan for the past six weeks for The Windsor Star. He's done an excellent job and I congratulate him for putting himself in harms way to help us get to know our Soldiers. His final post from Afghanistan is particularly powerful. KANDAHAR, Afghanistan — Maureen Eykelenboom's son was a medic with the Canadian Forces in Afghanistan who saw things most Canadians couldn't fathom let alone would ever come close to having to experience. Andrew, known to his friends as Boomer, once plugged the severed legs of an interpreter, hit by a rocket from bleeding out, thus saving his life. He and a fellow soldier did this while a battle raged on around them. Another time, the corporal scooped together into a body bag the pieces of a blown-apart comrade. Boomer, 23, was packing his bags and getting ready for vacation when he volunteered on one last convoy to the volatile border town of Spin Boldak. His armoured G-Wagon was spotted and targeted by a suicide bomber, and Boomer, like dozens of other Canadian soldiers serving in Afghanistan since 2002, was himself blasted to death on August 11, 2006. His mother, sporting the shiny Silver Cross on her lapel that next-of-kin get when their children, husbands or wives die while serving their country, made an emotional trip back to Kandahar for Canada Day, when she addressed Canadian soldiers on the current Roto, telling the mostly young volunteers that they don't have to die to become heroes, but that they are heroes just by willing to sacrifice themselves in the service of others. It's a message she and others here wonder whether others back home really understand.